The Geoffrey Parker backgammon sets are perhaps the finest in the entire industry. 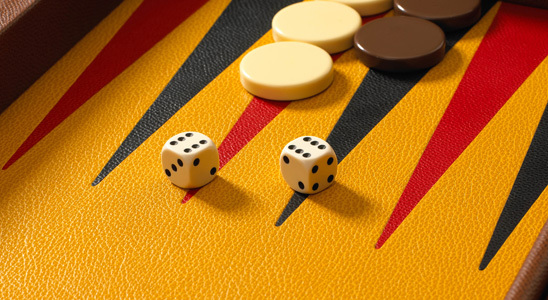 Among all products in our backgammon sets & boards category, Geoffrey Parker backgammon sets are king. Standing in front of one of the backgammon sets, you’ll notice a few things immediately. The quality of materials and the perfection of the hand inlaid points elevates the board from a collection of luxury materials to a real work of art. It’s larger than it appears in photos, and it’s heavier than one might expect. Everything about Geoffrey Parker sets seem larger than life, as though they’ve been hand made for royalty or an aristocrat. Pictured above is a Geoffrey Parker Prestige set customized by one of our favorite clients, Robert. You may recognize the color scheme from the Prestige’s product page. We ended up using Robert’s set as the example in our shop because, in truth, of all the customized sets we’ve sold, this particular one has been our absolute favorite. We hope you’ll have the pleasure of owning or playing on one of their sets.